Blue Laguna Restaurant and Lounge features live entertainment every night of the week with no cover charge!! This Laguna Beach restaurant serves tapas-style (small plates) dishes created with a California-cuisine influence. You can order combinations of small plates to create your own unique full meal or order a full plate of any specific entree. If you'd like to enjoy the beautiful Laguna Beach weather, you can sit outdoors in the tropical back patio! In addition to casual fine dining, Blue Laguna also offers a stylish lounge where you can order from an extensive beer, wine and tequila menu or enjoy specially created cocktails. The full-service bar hosts live entertainment, happy hour specials and specialty nights. Blue Laguna is also available to cater events! 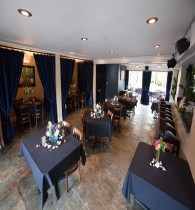 If you are planning family gatherings, birthdays, reunions, graduations, corporate meetings and any holiday parties contact this Laguna Beach restaurant to plan your catering! Located on the Holiday Inn property. Share Your Blue Laguna Experience! Do you have a great story, experience, or photos from Blue Laguna? Share your stories and pictures of this Laguna Beach restaurant, nightlife, live-music entertainment and full bar!